In section 1, Joy Aceron and Francis Isaac set the scene for the research, explaining the background to the study, case study selection, and the use of vertical integration as a conceptual framework. In section 2, Jonathan Fox introduces vertical integration and discusses some of the important propositions about why it is effective. In section 3, Joy Aceron discusses the evolution of civil society and social accountability initiatives in the Philippines. In section 4, Benedict Nisperos, Marlon Cornelio, Danilo Carranza, Frederick Vincent Marcelo, Rhia Muhi and Romeo Saliga present overviews of the seven case studies, which focus on civil society led reform initiatives in education, agriculture, housing, mining, indigenous rights, reproductive health and disaster resilience. 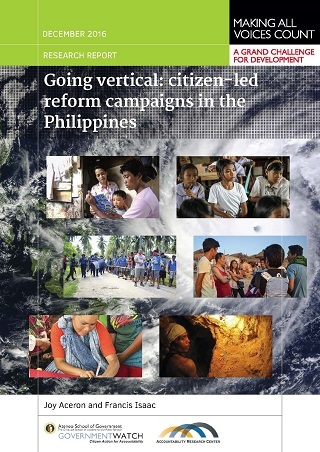 In section 5, Isaac and Aceron draw together the report by synthesising lessons about vertically integrated social accountability reform campaigns.